"Very knowledgeable of what needed to be done an how to do it." Very knowledgeable of what needed to be done an how to do it. "Dave was great, he answered all my questions." Dave was great, he answered all my questions. By Pat And Stu F.
Dave was born and and grew up on the South Shore of New York’s Long Island. There, his parents taught he and his brother to be conscientious boaters and leave the environment as untouched as possible. He says that’s probably why he went on to become an avid sailor and enjoy the” quiet” sport. After a short time working for the New York State Conservation Department he sought a degree in Marine Biology.His career path did not get to go there because, he says, the jobs just never materialized. Leaving Long Island in 1994 with his Handyman business and starting over in the Lowcountry proved to be the right choice. He says “I have never looked back, it’s just too nice here”. In 1996, perhaps through Divine providence, Dave discovered the Solatube product and became their dealer in the Hilton Head area. 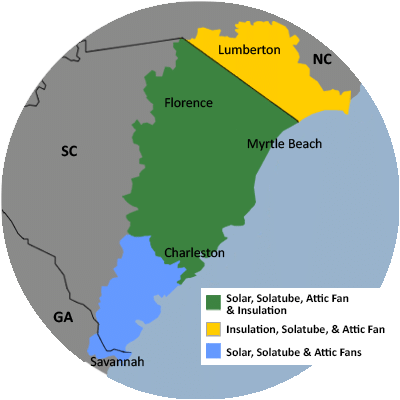 Now, all these years later in 2015, Dave has semi-retired and combined his business with Carolina Energy Conservation as a consultant for the Lowcountry area. He says “this seems to be a synergistic arrangement” as it allows him to pursue his love of the environment with environmentaly friendly products.